By Nadia Anuar in Culture. Updated on November 19, 2017 . Think treehouses are just backyard structures built for kids to play in? Well, think again. Constructed for different functions and in different forms, treehouses have the potential to be achitectural masterpieces, much like castles. They remind us that our natural habitat was once amongst the trees. 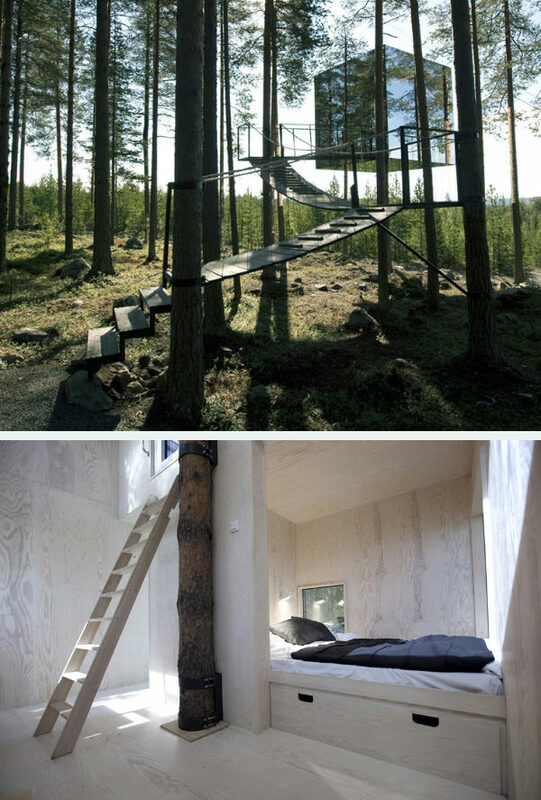 Below, we have compiled 20 awesome treehouses that really bring this notion to life. These magnificent structures will not only leave you speechless at how amazing they can look but will also make you wish that you had these beauties in your backyard when you were little. Mirror Cube. Designed by Tham & Vinegard architects, the cube is covered in mirrors which reflects its surroundings. Sweden’s ‘invisible’ hotel room contains a large bed, bathroom, lounge and rooftop terrace to soak in the view. The Sustainability Treehouse. This Sustainability Treehouse is located at the Summit Bechtel Reserve in West Virginia and it serves as a camp adventure site. Design architect, Mithun created this treehouse to provide visitors with the opportunity to explore and understand the site and ecosystem on the different levels of the structure. Roost Treehouse. It is designed to copy the natural curves found in nature. 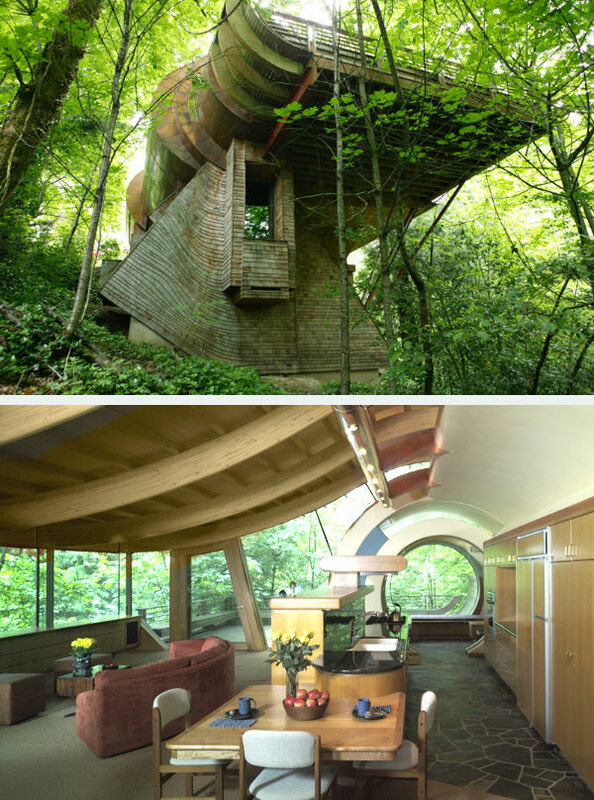 The purpose was to build a treehouse that could blend in with the surrounding forest. 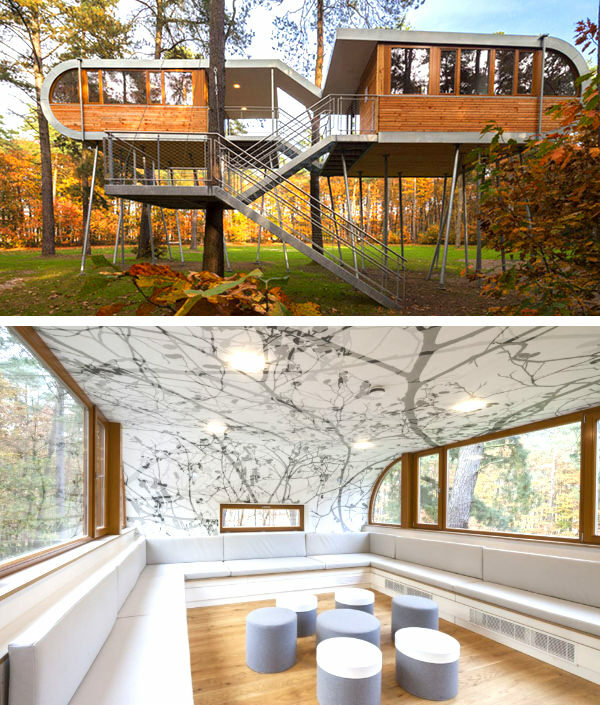 The treehouse is built using sustainable materials. 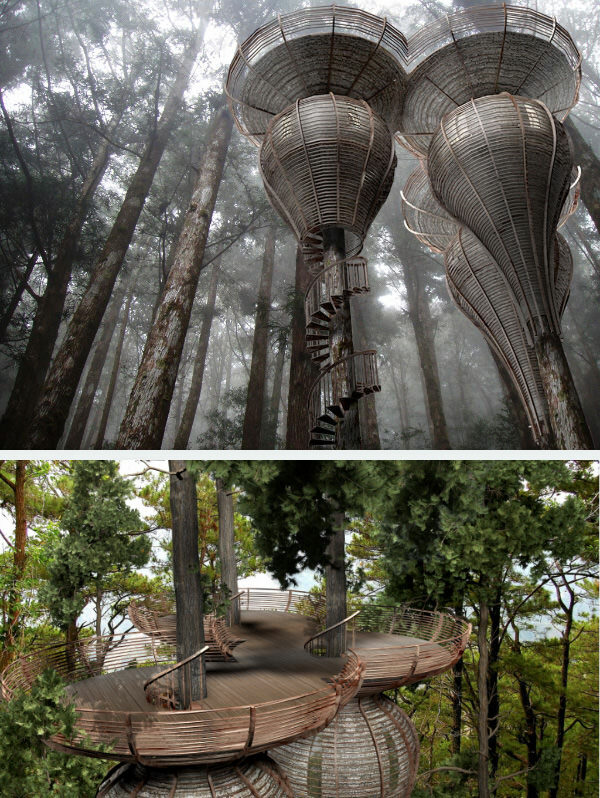 The design by Antony Gibbon looks like it came straight from Lothlorien (The Eleves’ forest home) in Lord of the Rings. Yellow Treehouse Restaurant. 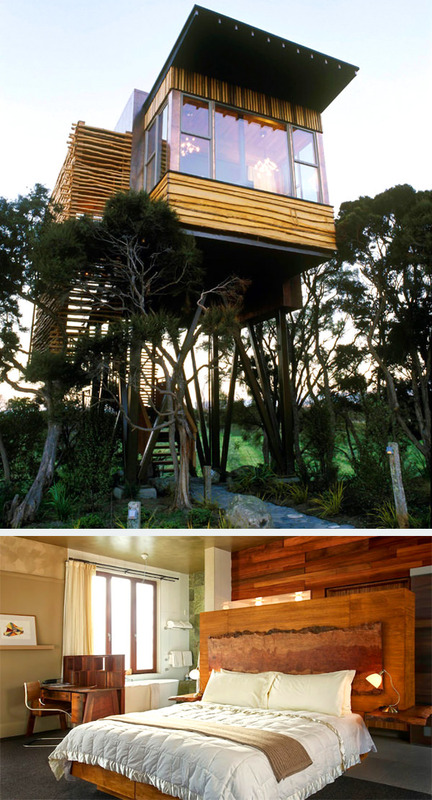 Built on a 40 meter high redwood tree, this treehouse is found in the north of Auckland, New Zealand. Shaped like a cocoon around the tree, the restaurant as well as its path, is illuminated by warm-colored lights at night. 4Tree House. This tree house concept gives it the appearance of floating among the fir trees in Lake Muskoka, Ontario, Canada. It is constructed on the base of four existing trees, which resembles stilts. There are three levels in total with varying transparency, letting natural light in and out as much as possible. Tea House Tetsu. 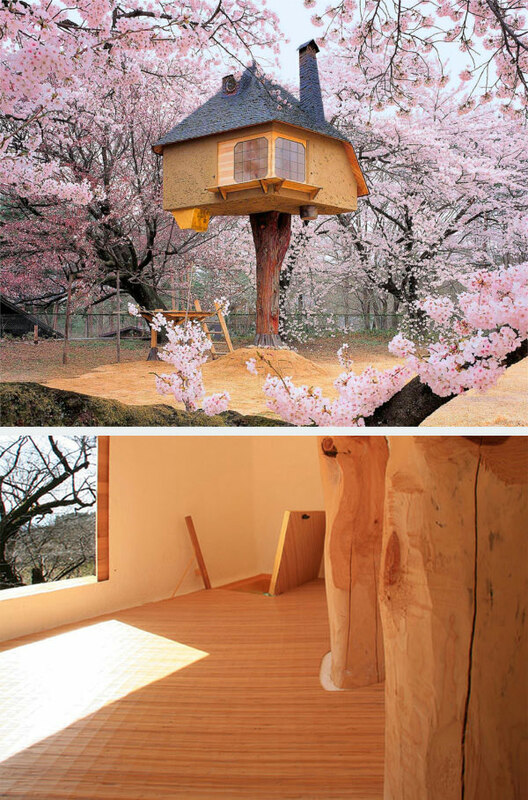 Located in Hokuto, Japan, the treehouse is surrounded by purple and pink cherry blossom trees. It is built especially for enjoying the cherry blossoms in full bloom and its also serves as a tea house. Horace Burgess’s Treehouse. 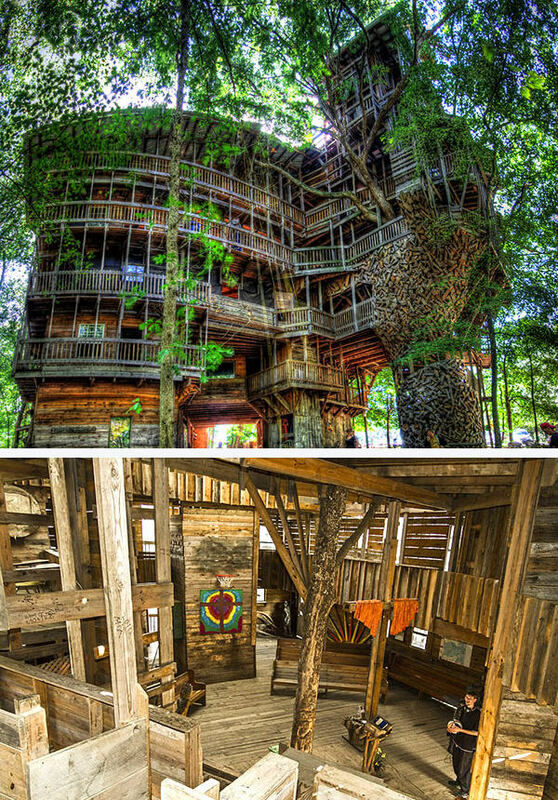 Located in Crossville, Tennesse, the treehouse is 97 feet tall and it uses 6 trees as its base. It took over 14 years to build this massive treehouse! Wilkinson Residence. Found in Portland, Oregon, this treehouse is built on a flag lot. The building was built to enhance the natural landscape as well as the flow of music. Banyan Treehouse. 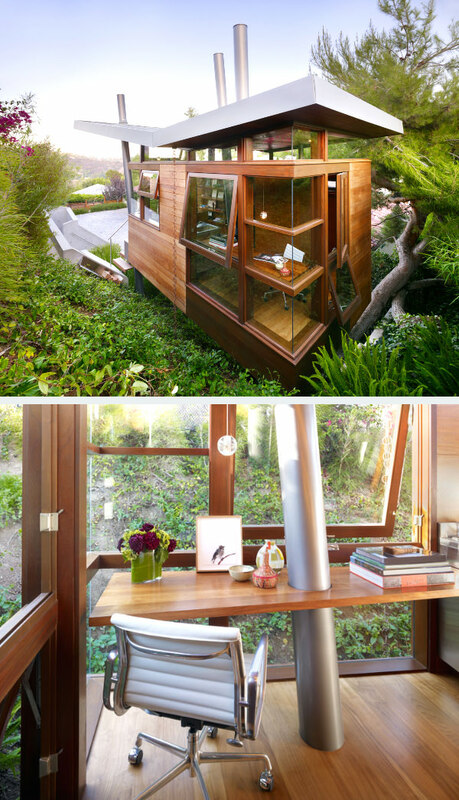 This luxurious tree house which is made out of wood and glass is the perfect getaway from the busy life. It overlooks downtown Los Angeles and is built on the base of a large pine tree. The Cocoon. 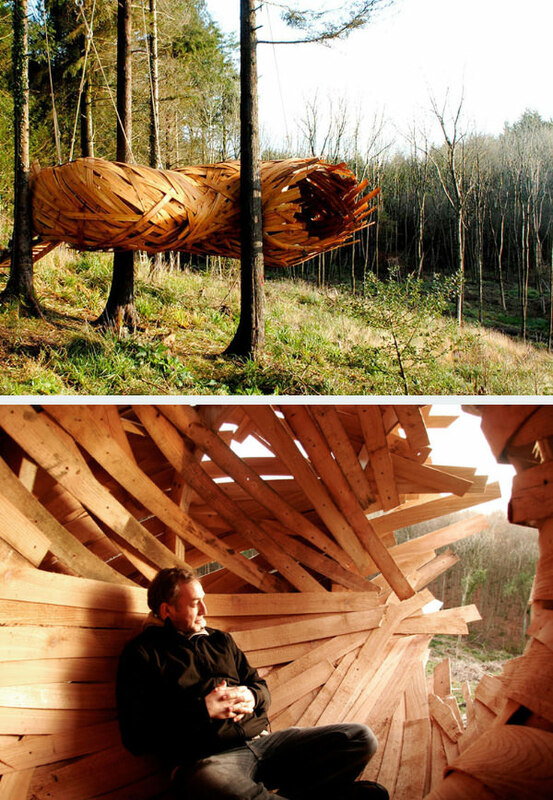 Built by students from London’s Architectural Association, it is a giant wooden cocoon suspended between the trees. It was visualized to be a quite getaway where dwellers can sit and watch the sun set. Free Spirit Spheres. 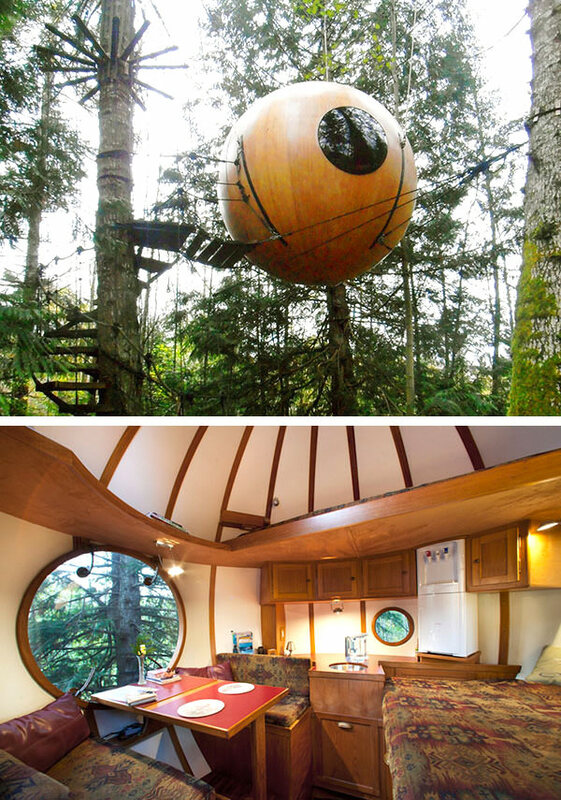 Situated among the tall trees in the rainforest of Vancouver, Canada, these handmade tree house spheres are suspended in the air with winding ropes. The spheres are available for overnight rental. Baumraum Treehouse. 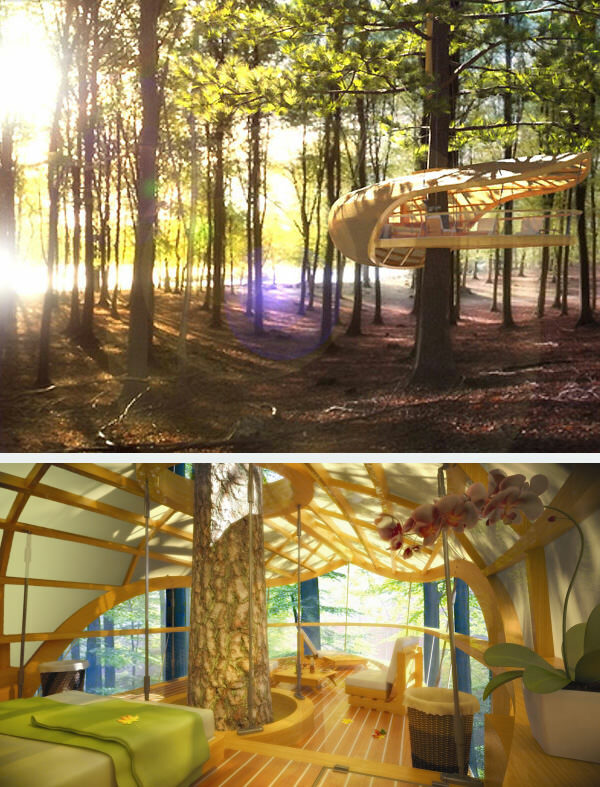 Designed by Baumraum, this treehouse can be found in Hechtel-Eksel, Belgium. It helps to close the gap between the economy and ecology. It is equipped with state-of-the-art eco facilities. E’terra Samara Retreat. It is a five-star eco resort that consists of twelve treehouse villas. It is situated in Canada’s Bruce Peninsula forest. The treehouse is suspended and it appears as if it is hugging the tree. Tree in the House. The structure is camouflaged amongst the trees in the mountainous city of Almaty in Kazakhstan. It is a transparent cylindrical volume with an empty core, where a towering tree rises from the space. Tree Snake Houses. Located in Portugal, the structure gives an illusion of a snake gliding between the trees. The design uses materials that would blend in with its surroundings. The architects used a new technology which allows a weightless easy-carrying structure. Hapuku Lodge and Tree Houses. Guests can choose to stay in two level family tree houses or a stand alone Olive suite apartment. Located on New Zealand’s south island, the lodge is near the top site for spotting whales and dolphins. La Casa Del Arbol. 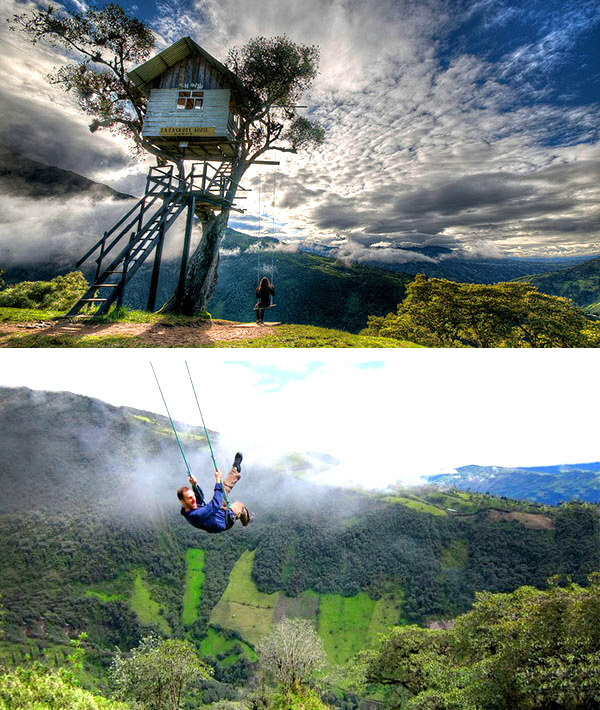 This unique treehouse has a small swing set that soars high over the Ecuadorian city of Banos. Thrill seekers will sail 2,660 meters above sea level. It offers visitors a glimpse of the edge of the world. UFO Hotel Room. 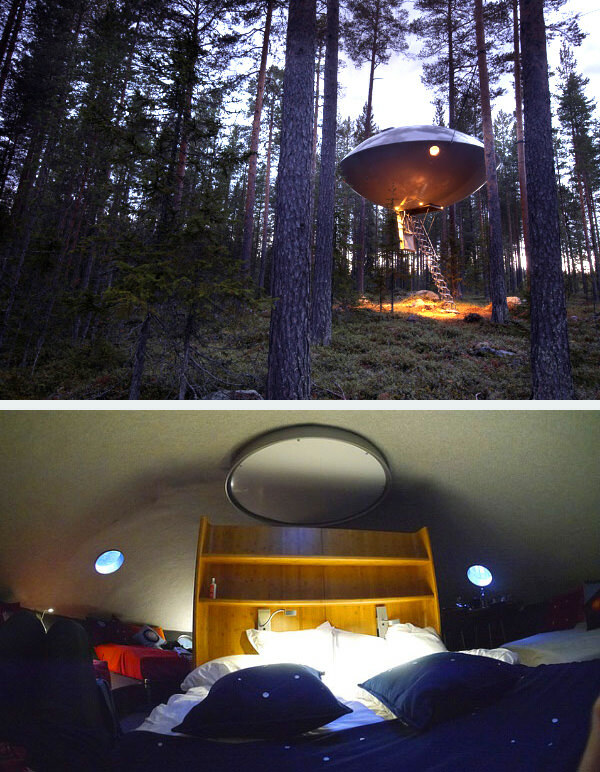 The Swedish eco hotel has added a UFO shaped room to its collection. 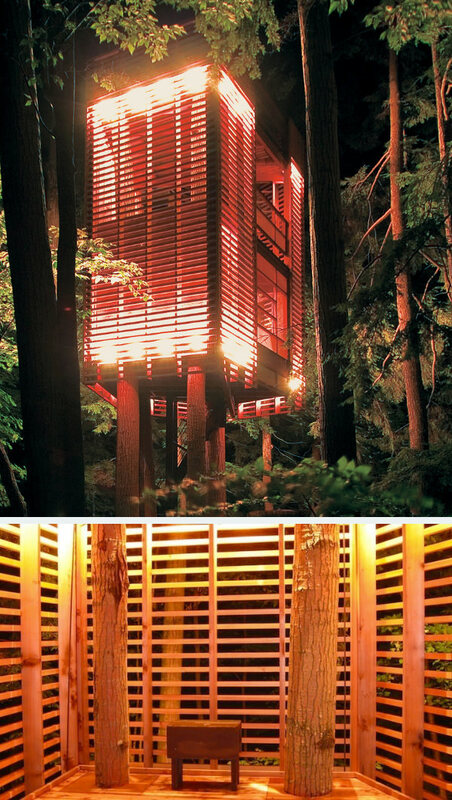 The lightweight structure is suspended in the trees and you can experience this for $625 a night. 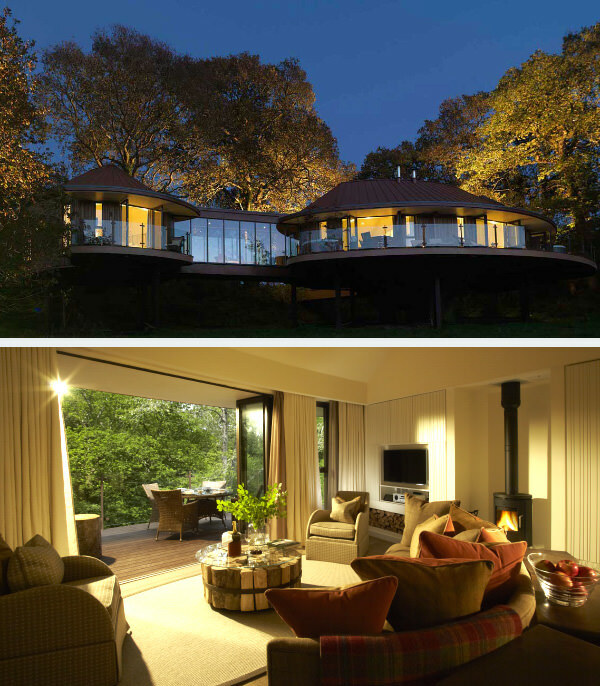 Chewton Glen Treehouse Suites. It is situated high above the ground in Hampshire, England. 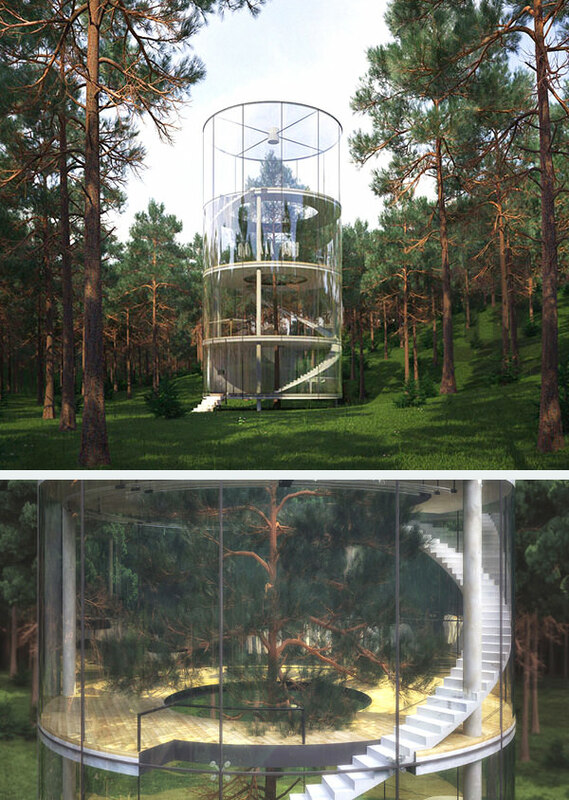 These luxurious treehouses are in a natural forest setting. It is on stilts and gives a panoramic view of the forest. The Enchanted Forest Treehouse. 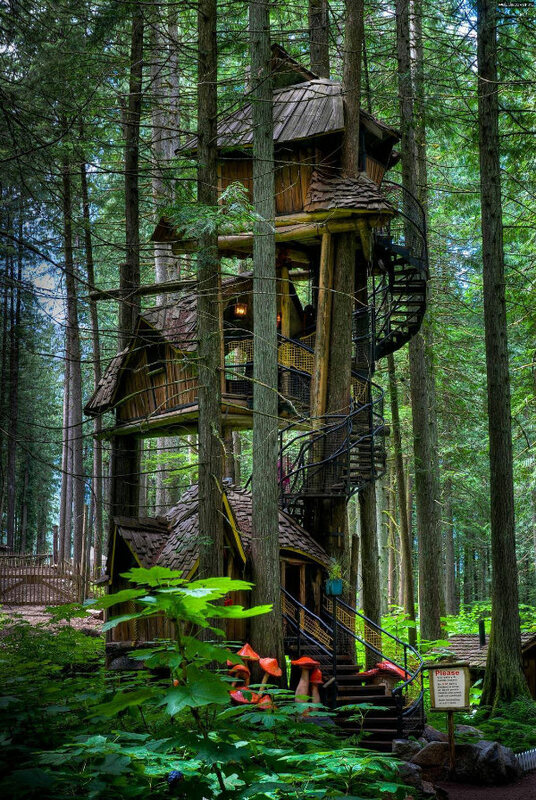 A three-story treehouse, probably the tallest treehouse in British Columbia, Canada.